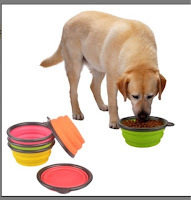 Set of 3 mixed colors: Travel Dog Bowls made from 100% food grade silicone. Set of 3 mixed collapsible lightweight, durable and reusable bowls in fun colors. 5 inches wide x 2 inches height when open and 0.5 when compact. Convenient for storage and transportation, great for taking on small or long trips. Or for going to kennels. Fits in pockets, purses, backpacks or glovebox. Simply pop up and then fold up to put away. These are ideal for small and medium sized dogs. Easy to clean and dishwasher safe. I used these and found them to be very easy to use. They are perfect for traveling. I had to drop my dog off with a woman that he stays with while we travel and I used the bowls. My dog ate out of them like they were his own bowls. He liked them a lot. These bowls are easy to clean and are easy to use. Very nice idea.. I can't find a link. Where do you get them?